Bus from Johor Bahru to Merlimau is one of the hot selling bus routes in Johor Bahru Larkin Bus Terminal. Since there is no flight and train service from Johor Bahru to Merlimau, bus become the only mode of transportation for locals who are working and studying in Singapore or Johor Bahru, with their hometown in Merlimau. Mayang Sari Express is the only transport company provides bus from Johor Bahru to Merlimau. Mayang Sari Express has up to 3 daily departure from Johor Bahru to Merlimau. Mayang Sari Express has become very famous among locals because of their safe and excellent quality bus service. The first bus stars as early as morning 9:30am and the last bus leaves in the evening 6:00pm. Mayang Sari deploys VIP coach to operate this bus route to ensure passengers having comfortable bus trip to Merlimau. The travel time from Johor Bahru to Merlimau usually takes about 3.5 hours depending on the road traffic conditions. Please note that all the buses in Malaysia have no toilet on-board. Washroom break will be given upon request from the bus driver. All the passengers will board the bus at Larkin Bus Terminal. Going to Larkin Bus Terminal is easy by using intercity bus and taxi. Upon reaching Merlimau, the bus driver will drop off all the passengers at Merlimau Bus Terminal. The bus ticket price for adult is RM 19.00 while for child is RM 15.00. 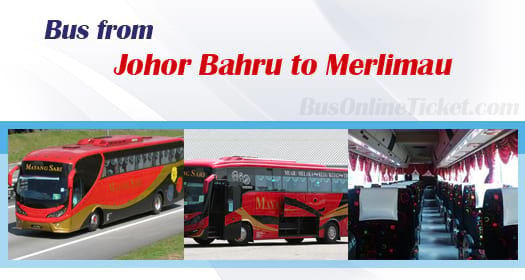 Booking bus from Johor Bahru to Merlimau online in advance at BusOnlineTicket.com is always recommended to avoid disappointment due to limited daily bus schedule. Booking bus ticket online is always the most convenient way to save your precious time and money to travel to bus terminal just for ticket.